Town Park community is sold out and is not in active development by builder. If you are interested in Town Park or similar new home communities, contact us today! Our agents are very familiar with new and newer construction in Hampton, and can identify resale opportunities in Town Park, as well as builder inventory available in nearby or similar communities in Hampton. To view 11 more pictures, interactive maps and the full, detailed description of the Town Park community, please Login. In new construction development, Town Park, homebuyers will find the right properties at the right prices. Houses for sale in this neighborhood are built for the modern family who still likes traditional touches. 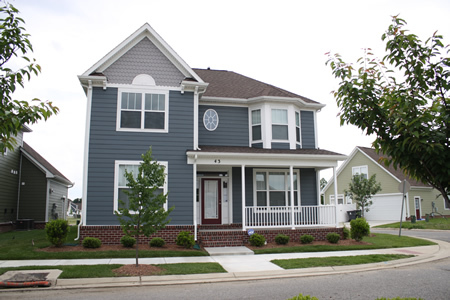 Located in Hampton, VA, this community is not far from military bases like Naval Station Norfolk and Joint Base Langley-Eustis. The houses for sale here give something back to homebuyers- value. Properties here have several models, the smallest one coming in right at 2,000 square feet. In Town Park, each new construction home may come with seamless aluminum gutters, splash blocks, insulated metal garage doors, professional landscaping complete with sod in front yard, concrete patio, covered front porch, privacy fence and more. Residents can also enjoy strolls along the on-site walking trails. New construction properties are highlighted with stylish features, further enhancing designs. Houses for sale give residents peace of mind knowing they’ve chosen a solidly built home that will last. Each home in Town Park may include gas fireplace with marble mantle, ceiling fan, custom lighting, eat-in kitchen, recessed lighting, Kenmore appliances, kitchen pantry, garden tub, water saving shower heads and toilets, bathroom exhaust fans, dual-zone heating and cooling system, gas hot water heater and much more. Hampton is the quintessential Virginia city on the water. Shops, entertainment and restaurants make this town more fun but the people are the genuine article. See an IMAX movie and take in some exhibits at the Virginia Space Center. Listen to concerts downtown at the Hampton Bay Days festival. Shop at Coliseum Central and Peninsula Town Center whenever the mood strikes. The location of these houses for sale gives homebuyers access to so much in this metro area. Purchasing a new construction home can be rewarding in so many more ways than just getting a residence. Explore the possibilities in the properties at Town Park; you never know where they could lead. I'm a builder and I build here too. Send me more information about communities similar to Town Park. Our agents gladly offer FREE property tours of Town Park, Hampton and homebuyer consultations to all serious buyers. Our Hampton SH Pro is prepared to represent you and your interests so you can move into your dream home.